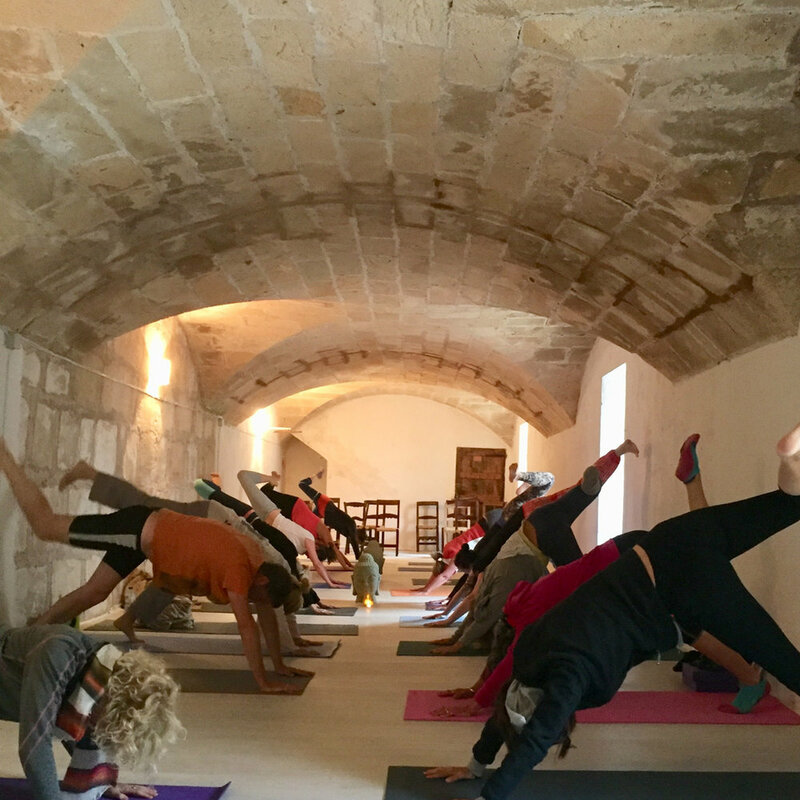 …it’s a match made in heaven, and you’re in for a treat, even if I do say so myself ;) I am beyond excited to team up with The Natural Edge and offer you an awesome week of yoga, fitness, sunshine, all the food and lots more! We’ll be taking you to a finca on the Balearic island of Mallorca, amidst lemon and olive groves, far away from the touristy bits. Our offering includes daily outdoor workouts lead by Simon Jeffries, ex UK special forces, two yoga classes with yours truly, as well as plenty of outdoor activities you can enjoy at your leisure. We have our own swimming pool, and a trip to the beach is on the cards for sure. We want this to be your time, time to take out from your day-to-day life – meaning you can dip in and out of activities as you wish, to make this trip your own. Perhaps some days you fancy a lie-in, or a solo wander across the surrounding land. All meals are included, and plant-based. We’ll have our own chef, Catherine, who will prepare delicious, home-cooked meals daily. In terms of accommodation, you’ll be sharing en-suite twin rooms, but don’t worry if you’re planning on coming on your own – we’re only taking a small number of people to keep it personal, and it’s a great opportunity to spend a week doing the things you enjoy, trying new activities and relax with like-minded people. It’s starting to fill up, so if you want in, secure your space today! Please click here for full details and to register, and then all you need to do is book a flight to Mallorca and we’ll take care of the rest (incl. picking you up from and dropping you off at the airport at no extra charge). Looking forward to seeing you there, truly cannot wait! You’ll likely know the locust pose (salabhasana) as ‘superman’ as part of your warm-up, arch to hollow for example. Did you know that this pose is also a brilliant way to build strength in the back with a view to preparing the body for the deadlift, one of the fundamental lifts of CrossFit? At first glance, the pose looks quite simple, but don’t be fooled – correct alignment and muscular engagement are key, and this takes practice. Locust pose opens the chest, shoulders and neck while also working the abs and promoting mobility in the lumbar spine, the lower back. Now, back to the deadlift – in this lift, the hips extend under load while maintaining the integrity of the spine. To achieve this, the spinal erectors and the quadratus lumborum (among others) have to get to work. To perform this movement safely, the curve of the lumbar spine needs to be maintained. Failure to do so is a common reason for injury resulting from incorrectly performed deadlifts. In the locust pose, we practice the action of lifting the upper back without creating strain in the lower back, which will help lengthen and strengthen the muscles involved in this movement and also improve your awareness of targeted muscular engagement in these areas. There are a number of variations to the locust pose, including some that will help promote overhead mobility – something most of us struggle with! My Yoga for Sports classes are suitable for all levels, complete beginners welcome. Check my schedule for class times and locations, see ya on the mat! Locust or Superman? You decide! To really recover means more than having an Epsom salt bath, taking a few days off training and waiting for the DOMS to subside. Your nervous system plays a key role in recovery, however this aspect is still often overlooked. The human body is pretty damn clever. Our autonomic (i.e., we cannot consciously control it) nervous system is made up of the sympathetic nervous system (SNS) and the parasympathetic nervous system (PNS). The SNS mobilises the body’s resources in a fight or flight situation, whereas the PNS regulates the bodily functions needed to repair and recover. The body is designed to spend the majority of its time directed by the PNS, with the SNS response only triggering in case of a life-threatening emergency. However, the body interprets all stress, be it mental or physical, as a reason to activate the SNS. Therefore, physical exercise is a stressor on the system. What does this mean for your training or fitness regime? The key to improving your recovery is to activate the PNS, which is exactly what we are doing through the practice of yoga - even if it may feel challening at times. Linking movement with breath through a series of postures (asanas) as well as practising breathing techniques (pranayama) to calm down the system, slow down the heart rate and elicit the body's relaxation response. Better recovery is the main purpose of my yoga for sports class - click here to find out where you can practice with me. The sun salutation - why is it awesome, and why should you add it to your training regime? Arm balances are an excellent - and ninja - way to build strength in the arms and wrists, but also to improve your proprioception and fine motor skills. To allow us humans to walk upright and support much of our weight on our two legs, the hip joints are designed to be robust and stable. The shoulder on the other hand is extremely mobile, and therefore requires support from the surrounding soft tissues – muscles, tendons and ligaments. Because the joint is so unstable, shoulders are prone to pain and injury. This needs to be considered when practising any arm balance, as it’s easy to just collapse into the pose, without considering the necessity of having to lift up through the midline. Abdominal strength is required in order to stabilise the torso and allow the pelvis and legs to come off the ground to achieve this type of posture. In other words, you’re equally going to have to work those abs in order to take flight. Muscles are strengthened in the range of motion in which you work them, so it's good to mix things up and move in different ways to create new movement patterns. Don't get hung up on the end result - focus on the progressions (kramas) along the way and take them as stepping stones paving the way towards where you want to get to. In other words, they're huge achievements in their own right. Never skip the basics!!! Could the diaphragm be a game changer for your core strength?